Telangana KGBV Contract Posts Online Application Form, TS KGBV SO, PGCRT, CRT, PET Posts Apply Online link here. 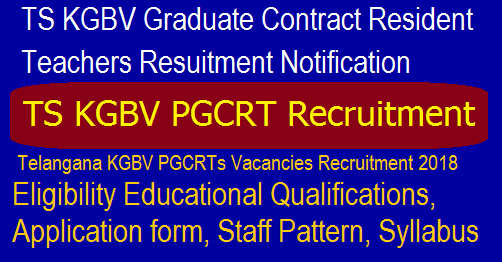 TS KGBV PGCRT Selection list 2018 TS KGBV PGCRT Recruitment 2018 - 588 Vacancies of Graduate Contract Resident Teachers Apply Now : TS KGBV PGCRTs Post Graduate Contract Resident Teachers 588 Vacancies Recruitment Eligibility List of 84 Girls Colleges 2018. Telangana KGBV PGCRTs Vacancies Recruitment 2018 Eligibility Educational Qualifications, Application form, Staff Pattern, Syllabus and List of Schools Post wise Educational Qualifications for the post of Post Graduate Contract Resident Teacher (PGCRT) Post Graduate Contract Resident Teacher (PGCRT) with monthly honorarium @ Rs.23,000/- per month.Admissions are going on in Selected KGBV Schools for the Class XI. Post wise Educational Qualifications for PGCRTs in KGBV Schools of Telangana for the Groups MPC BiPC CEC MPHW Vizz PGCRTs Posts Staff Pattern in each College Telugu English Mathematics Physics Chemistry Botony Zoology, Civics Economics Commerce Eligibility Criteria Educational Qualifications Selection Procedure Online Application . Telangana Govt decided to start Class XI in selected 84 KGBV Schools for the Academic year 2018-19. Accordingly Admissions are going on. Education Minister Sri Kadium Srihari ordered officials to take up Recruitment process for Post Graduate Contract Resident Teachers PGCRTs in all selected KGBV Schools. Commissionor and Directorate of School Education issued order to District Educational officers to Start the Process of Recruitment as per the Guidelines. Notification may issue District wise by the District Educational Officers shortly. All the District Educational Officers & EO- DPOs, SSA in the State except Hyderabad and Medchal- Malkajgiri Districts are informed that udder the integrated scheme of Samagra Shiksha Abhiyan, 84 selected KGBVs in the State are upgraded up to Class-XI from this year 2018-19 to achieve the objective of providing access and quality education to girls of disadvantaged groups and to ensure smooth transition of girls from secondary to Class XII. In the context of above, the list of 84 KGBVs, admission procedure, qualifications for engaging of staff and staff pattern are sent herewith with a request to take immediate action in the matter as per the schedule and guidelines without any deviation. They are requested to furnish the compliance report accordingly. TS KGBV PGCRT Online Application form Post Graduate Contract Resident Teachers Recruitment 2018. PGCRT Vacancies in 84 Junior Colleges in Telangana Kasturbha Gandhi Balika Vidyalaya.